If you have looked at the slideshow carefully you can try this simple quiz. There's no diary today. It's a holiday. Instead ... tell about your visit to the market. You might like to send a Diwali Card. Hindu people enjoy sending them to their friends and family. The original Ramayana story had 50,000 verses to it. You can read a much shorter version of it here. The pictures come from many different places to show some of the different styles of asian art. Click on the chapter which you would like to read. Visit the 'glowing city.' 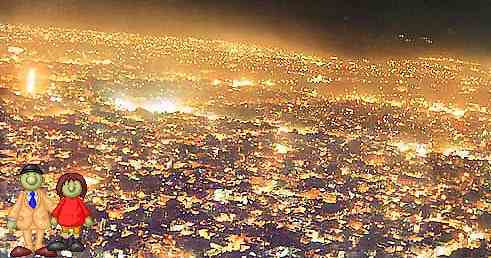 See Jaipur at night on Diwali at the Indialinks web site. To celebrate the festival houses are decorated with Rangoli patterns. Jyotsna Kamat has some examples of how to build these patterns. 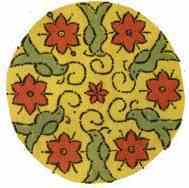 Use the ideas to make a Rangoli pattern.